Look I'm happy Richie's getting some action and the tone of this trailer's a lot lighter than the last but since I don't think any of these girls are right for him I'm still struggling to get enthused. Of the available options, Cass is by far the best choice IMO. She's a cutie and has the Blonde Advantage as you rightly pointed out @Dirty Street Pie... but he doesn't seem to go for sweet girls. Question for the people following Cass and Richie: is there any evidence they might be together? Not a sniff that I can see @Bobette, although Richie is not a heavy Insta user, so can't get much of a read on what he's up to. I'd be very surprised if there was anything between them. @Bobette IA I don't see any of the women as a match for Richie. I won't be surprised if he realized that too and left? @AllAboutLove we can only hope. Ideally he went on, got a bit of an ego boost, maintained the high ground over Alex and left with his head held high. Might help him find him HEA in real life. I'm just not picking up what Cass is putting down. I don't think for one minute she's falling for anyone there or is even there for love. And I hope Nathan is talking about someone else, cause he has known Cass for some time. IA @Agent99 - Surely Nathan can't pretend he's never met Cass considering they've been friends IRL for ages and post pictures on social media together. IMO he's talking about Vanessa. And I assume Cass is talking about Richie. It seems to me like they're setting her up as the sweet girl looking for love with the sweet boy before Cat, Rachel and Alex come along and "ruin it". It's been discussed upthread that the girl with the heartbreak/sweetheart edit might be next Bachelorette. Could it be Cass......? They kind of owe her after her clinger Bach edit IMO. The Cass/Richie storyline may be a means to an end - Cass gets support/sympathy for her own season, Richie looks like a catch, and Alex looks EVEN WORSE for causing drama. That would explain why (I agree with you) Cass is not convincing in the preview. She may have already been promised the role of Bette so wasn't invested in the BiP guys. I didn't watch last season, is the Aus version like the US? @Louise wrote: I didn't watch last season, is the Aus version like the US? @Louise In general it follows the same formula but the AU show is smaller in scale than the US show - we've had less seasons of the main show so the pool of former contestants doesn't give them a lot to work with. At the end of season 1 there were 3 couples including one engagement. The engaged couple (Sam & Tara) split a few weeks after the finale aired. Jarrod & Keira split up too but recently got back together. The third couple were Ali & Grant. They were "committed" in the finale but then then a line of text came up along the bottom of the screen saying "it didn't work out, so we've made her the next Bachelorette". So that was a weird way to end the show but overall I enjoyed it. This season however is shaping up to be less about relationships and more about drama. I am not expecting to enjoy it as much but of course I still watch. We have so far only sleuthed one AU couple to come out of the season (Alex & Bill) and IMO few people will be happy about that since neither of them are particularly popular with the AU audience IMO. Other than them, it's suspected the two US contestants (Caroline Lunny and Alex Bordy) hook up, so I presume they will be the second couple in the finale. Don't expect most AU viewers will even know who they are though. Have you watched much AU Bach and Bachette? If so I'd be interested to hear your opinions of the cast (I remember you saying you lurked during previous AU seasons but not sure who you've seen). Thanks @Bobette I saw the most recent AU Bach and Bachette so decided to watch this as I knew a lot of the cast. I don't expect much from this season but interested to see how it plays out. WHO mag has announced the new BetteAU this year and I posted it in the thread HERE so discussion can take place there. I believe it is legitimate info and expect an official announcement by TEN soon. 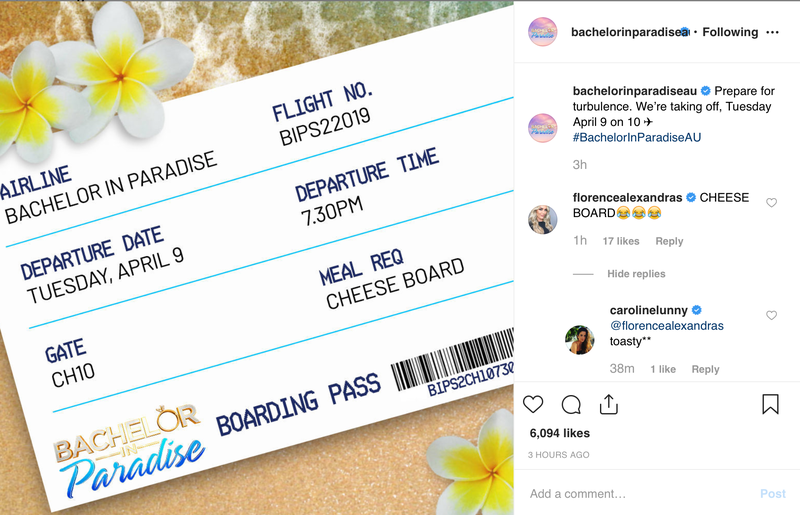 The best part is that this is leaked before BIP S2 airs. I believe this is deliberate on TEN's part and that way audiences and the BIP women know who the BetteAU is and no campaigns for it this season. Plus viewers can watch knowing it won't end in an Ali situation with a BIP contestant announced as lead at the end.